Batwing faces his most dangerous mission yet – travelling straight into the madness that is The Gotham Underground to put an end to those behind The Uprising! Will Batman, Incorporated be in the market for a new Batwing? Or is our hero ready to prove himself once and for all? Story– Luke Fox/Batwing faces Menace after watching the villain kill Mother Anubis and decimate the Anubis Cult. They have a long bloody battle with David almost unmasked. Lucius and his wife find their marriage strained as they deal with their now brain-dead daughter. Tiffany manages to escape from Rat Catcher while Menace and Batwing have a bloody brawl. Action– This issue has one f the best fight scenes of 2014! This is a bloody, bone breaking, visceral exchange between former friends. Thankfully the beautiful art of Julio Ferreira and Eduardo Pansica is up to the task. The battle is fluid as both combatants pummel, clobber, mangle and almost maim each other. Honestly I recommend this issue for action junkies heartily because this fight alone is worth the cover price! Black Heroes- Batwing/Luke Fox is still in the driver’s seat, big daddy Lucius also makes appearance alongside his wife Tanya, brain-dead Tam and the feisty little sister Tiff. Emotional- Watching Lucius and his wife feed their brain-dead daughter tugged at this reviewers heart-strings. The art manages to capture and convey just enough of the pain, guilt and sorrow of both these parents who managed to have a successful nine month pregnancy, a successful birth and eighteen years of love and devotion poured into this child only to have it snuffed out and their child becomes this….husk? This shell? That is painful as f**k and the story and art accurately portrayed all this. Kudos to the team! Art- Julio Ferreira and Eduardo Pansica are still on art and as I’ve stated above the art is on point! Action flows seamlessly, characters have just the right amount of emotion and the whole packed just looks damn good. Cover- I don’t even have words to describe how much I loathe the almost yellow, begging to be dropped in the bargain bins thing on Batwing this month. I’m not feeling it at all. Cancelled– It took me awhile to review this issue after the news of its cancellation wasn’t announced so much as silently slipped out thanks to advanced solicits. Potential– Mother of Anubis was touted as a big bad in this underground city and she get’s killed in the blink of an eye despite have an interesting design and potential. 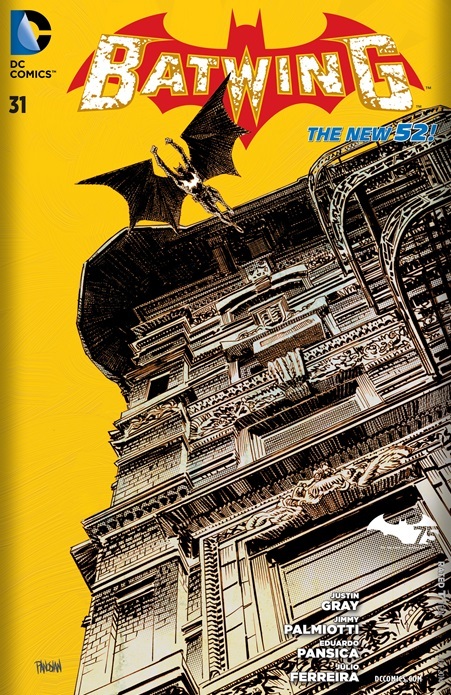 Batwing #31 is an action packed, well drawn and emotional roller coaster! We give Batwing #31 – 4/5 stars!